Nobody thinks of the recycle bin until they do something stupid. I have done a lot while my Microsoft SharePoint development; so it made me think that how recycle bin on SharePoint works that it almost saved me from hear attack on several occasions. We are very familiar with the recycle bin on our computer. If we delete something by mistake, we can recover it from the recycle bin; very simple. All the versions of SharePoint have a similar recycle bin like your PC. In fact, it is more advanced in some areas. This recycle bin plays a great role in all the activities of Microsoft SharePoint development and SharePoint management. 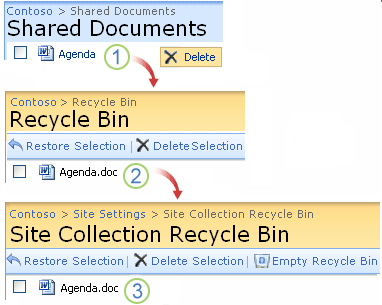 How SharePoint recycle bin is more awesome? The recycle bin on your PC can store files and folders, while SharePoint’s recycle bin moves a bit ahead from the PC. It can resurrect any user-created content that was deleted on the SharePoint system. Let is be a file, folder, document library, event from calendar, task, contact, or even a whole Sharepoint site or sub-site. SharePoint recycle bin can catch all of them. This great efficacy help the developers a lot in their Microsoft SharePoint development projects, and all the website and intranet related tasks too. Anything deleted on SharePoint can be recovered easily. For example, a user deletes a file Attendance.pdf from a library. I am currently suing SharePoint 2013. However, the functionality is almost identical in all the SharePoint versions. Every user on SharePoint has a recycle bin for his/her account. It is the place where the items deleted by the user are stored for a time period. So, the deleted file Attendance.pdf will also end up here. The SharePoint Administrator also can access to the Site collection Recycle Bin. It is a collection of all user’s separate recycle bins. It means that the site admin can have access to all the individual recycle bins and can restore the files on behalf of the users. So, site admin is the second person who will see the Attendance.pdf in the Site collection recycle bin. If a user empties or deletes the file Attendance.pdf from his individual recycle bin, the file moves to the second level recycle bin. The second-level recycle bin is accessible only by the site admin. It is the last line from where the file Attendance.pdf can be resurrected. How to restore the deleted item from SharePoint Recycle Bin? Any user can easily restore a deleted item from the SharePoint recycle bin. 1. Go to Site Settings > Recycle Bin. 2. Look for the item you deleted in the list. 3. Click on the checkbox by the side of that item. Select the file you want to restore from SharePoint recycle bin. 4. Click on Restore Selection. Click on Restore Selection to resurrect the file or Delete Selection to permanently loose the file. Your deleted item is now restored. PS: The restored item will not only be restored to its original location but the original metadata and version number will also be restored. Thus, any Microsoft SharePoint development task or SharePoint management would have been very tough without this tool. Thank Microsoft that it catches them all. Please note that any item in SharePoint recycle bin stays there for 93 days from the date of deletion. So, resurrect your files before that to avoid losing them permanently.